In 2007, I was doing my own 24 hour vigil, no food, no water, no sleep inside a secluded forest space. About 10 paces long by 10 paces wide. I did not leave this space and stayed there for the whole 24 hour vigil. Just watching myself. Tracking my thoughts, feelings and movements over this time. Inside this space. I would place a stone into a hole for each hour passing. A lesson learnt. 24 stones in total. At around 2am in the darkness, I noticed a white light in the trees. It perplexed me. It looked like a hooded figure holding a child. I thought I was just imaging things. It stayed there so I looked away. Avoiding it. Rationalised that it was just starlight through the tree canopy. But I remembered crying and this feeling of compassion. Maybe I was feeling sorry for myself. Who knows. So I waited until 6.05am in morning and wrote down the following..
Over a year later in September 2008, again out in the forest. I had dug a cave in the side of a bank to sleep in. It was getting dark and I had lit a candle inside to continue digging. 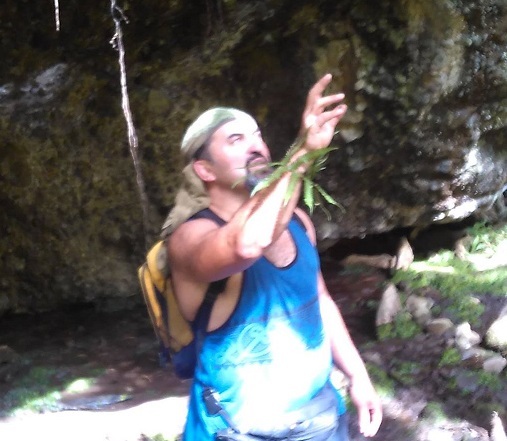 I had just finished when I decided to pull a rock out of the back cave wall. The shadow cast on the wall from the candle onto the rock indention looked like the Mother Mary holding a baby. So I decided to wait until morning and have another look. It looked different in the daylight coming through the cave entrance. But I knew that there was an outline, an imprint on the wall. So I shaped the soft rock with my spade and made a small altar. I left the candle and some flowers. 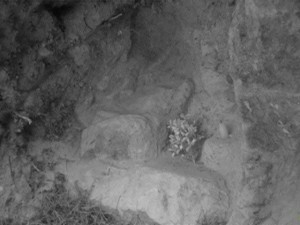 This black and white photo was taken when I left the cave. Ironically a little baby niece called Te Puea was born the same time I made this little altar. So I dedicated this little altar to her birth. She is now 8 years old (as at 2015). Tohu Three – Third Sign. In March 2012, I was visiting an eco-village Te Tihi near Turangi, Taupo here in New Zealand when I was talking to Maori man whose name was Kereopa. He seemed a spiritual man with moko tattooed on his face. For some reason, our conversation turned to the Madonna and I shared the above experiences. You must be the one I have give this taonga (talisman) to? 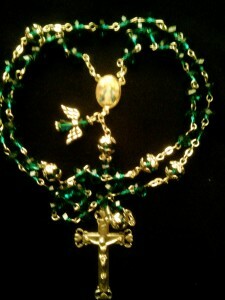 So he goes away and comes back with a green rosary bead with Mother Mary and a Crucifix. He had been given it by a priest or nun from some monastery in Europe I think. I could have this wrong. He was told that he would meet someone whose story would resonate and he was to give this rosary. He says a prayer and gives this to me. I only tell you this because it must have some significance for me. This is part of my mythology. Part of my life story. My own book of mystical experiences. Yet Madonna does not really fit into my Maori spirituality as I know it. Papatuanuku, Hinenuitepo, Hinenuiteao, Hinemoana, Kokawhenua and the other many female Maori goddesses. Maybe it comes from my Gaelic lineage. I dunno. Maybe I need to let go my cultural preferences. Maybe this goes a lot deeper than my surface story here. 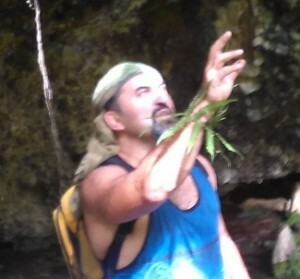 A good friend said it was part of the Mother Earth, Gaia, Sophia energy coming through me. Papatuanuku as she is known here in Aotearoa. Hmmm it is what it is. Or whatever meaning we take from it. You must track the spiritual signs or tohu that happen in your life. It is part of your own mythology. Your life story. Who knows what wonders may reveal themselves? The great mystery behind our world of man-made appearances.